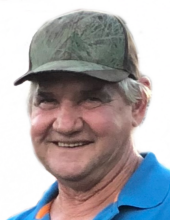 Celebrating the life of Danny Ray Wilson, Sr.
Obituary for Danny Ray Wilson, Sr.
Danny Ray Wilson, Sr., 63, of Blairs, Va., passed from this life on Monday, November 12, 2018. He was born June 11, 1955, to the late Mary Carter Wilson Cross and the late Roy Wilson, Sr. Mr. Wilson is survived by his loving wife, Bonnie Doige Wilson. He loved hunting and fishing, and also enjoyed gardening, cooking and softball. Mr. Wilson will be remembered as a loving husband, father and grandfather – an honest, hardworking family man. In addition to his wife, he is survived by his daughters, Leslie Wilson (Randy), Tonya Wilson (Daniel), and Carrie Wilson (Josh); his sons, Danny Wilson, Jr. (Stephanie) and Richard Wilson (Rikia); his sisters, Mary Ann Allen and Delores Mayes; his brothers, Roy Wilson, Jr. and Herman Wilson; as well as his grandchildren, Thomas, Nathan, and Cassidy Collins, Michael Touchstone, Jr., Jacob Morris, Hayleigh Sims, and Madison Smith. In addition to his parents, Mr. Wilson was predeceased by his brothers, Bobby “Sam” Wilson and William “Chubby” Wilson. Funeral services will be held at 11 a.m. Friday, November 16, 2018, at Norris West End Chapel, 511 Church Ave. Danville. Interment will follow at Danville Memorial Gardens. The family will receive friends Thursday evening, November 15, 2018, from 6 p.m. to 7:30 p.m. at Norris West End Chapel, and at other times at his daughter’s residence, 2158 Twin Arch Drive, Danville. Norris Funeral Services, Inc. & Crematory, West End Chapel, 511 Church Ave., Danville, Va. is respectfully serving the Wilson family. Online condolences may be made at www.norrisfuneral.com. To send flowers or a remembrance gift to the family of Danny Ray Wilson, Sr., please visit our Tribute Store. "Email Address" would like to share the life celebration of Danny Ray Wilson, Sr.. Click on the "link" to go to share a favorite memory or leave a condolence message for the family.